Apprenticeships specialist Seetec Group has scooped two national awards which recognise excellence of provision across a wide variety of industries and sectors. 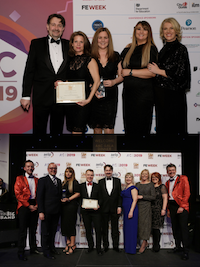 Outsource Vocational Learning, part of Seetec Group, has been recognised as Apprenticeship Provider of the Year for Transport & Logistics, while Seetec won Business & Administration Apprenticeship provider of the year. Winners of the FE Week and AELP AAC Apprenticeship Awards 2019 were announced during the Annual Apprenticeship Conference Gala Dinner in Birmingham on 28 March. In their second year, the awards attracted more than 350 entries, with a range of new categories celebrating 13 individual apprenticeship routes. With more than 20 years’ experience, Outsource was chosen for its role in raising the profile of the transport and logistics sector, working closely with the British International Freight Association (BIFA), as well as developing new apprenticeship standards for aviation and a series of interactive modules for freight forwarding. With the sector facing up to an ageing workforce, technological change and the impact of Brexit, Outsource has been at the forefront of developing early talent programmes and focusing on upskilling of existing staff to meet current and future challenges. Seetec has been at the forefront of developing the Business Administrator Standard and is achieving high completion rates, exceed national averages. The Group has led the way in helping large employers to Leverage their Levy and worked closely with a multi-national law firm to develop the Business Administrator standard for legal secretaries and administrators. Seetec practises what it preaches, introducing its own internal apprenticeships after the Levy commenced, and achieving the Gold Investors in People Standard for the second time in 2018, demonstrating its commitment to learning and development. Anyone interested in launching their career through an apprenticeship in a wide range of different sectors should contactapprenticeships@seetec.co.uk, telephone 01702 208270. Employers interested in recruiting apprentices should contact Seetec on 0800 3891 999, email employers@seetec.co.uk.